Best lenses for Sony A9 mirrorless camera are listed below for full frame E-mount users. Here are the top rated Sony A9 lenses. Sony A9 comes with serious speedy technology and is aiming at true sports professionals. It shoots faster than any other full-frame camera out there thanks to a stacked CMOS sensor with incredible autofocus coverage. You’ve already got the Alpha A9, an amazing full-frame mirrorless camera, now it’s time to invest into building a lens system. With that in mind, we wanted to list the best lenses for Sony A9 in various categories. All of these have superb image quality. The Sony A9 features a 24.2MP full-frame Exmor RS stacked CMOS sensor and BIONZ X image processor. The camera is capable recording UHD 4K video internally, and shooting with an expanded sensitivity range to ISO 204,800. The Alpha a9 offers 20 fps blackout-free burst shooting with uninterrupted viewing and AF/AE tracking. A larger buffer allows up to 241 compressed RAW images or 362 JPEG images to be captured in one continuous burst. Additionally, 693 phase detection AF points covering 93% of the frame track even the most erratic and fastest-moving subjects across the frame. Below are the top recommended and best Sony A9 lenses that are excellent for both complete amateurs and highly advanced photographers. Sony FE 24-240mm f/3.5-6.3 OSS ($998): Perfect travel and walking around lens. It has fast focus and does capture sharp images and comes with OSS when natural light is low. All in all, it is reasonably priced and the ultimate choice in convenience. And it’s an okay solution for those on a budget. Sony FE 85mm f/1.4 GM Lens ($1,798): The top FE lens for portraits! Perfect lens for portrait photography, and it is actually ideal for a wide variety of subjects! If you want a less expensive 85mm lens, try the Zeiss Batis 85mm f/1.8. Zeiss Batis 85mm f/1.8 Lens ($1,199): An ideal portrait-length lens, this Zeiss Batis 85mm short telephoto has been designed specifically for full-frame E-mount mirrorless cameras: superb sharpness, fast & quiet auto focus and Dust and weather sealed. Sony Zeiss FE 55mm f/1.8 Sonnar T* ($998): This is known as the sharpest lens in this category. Bokeh, colors and sharpness are absolutely stunning and the lens isn’t much expensive either. Sony FE 50mm f/1.8 ($248): This one stands as the most affordable glass here! The budget-friendly 50mm lens has a big f/1.8 aperture perfect for portraits, low light or just isolating your subject. Sony FE 85mm f/1.8 Lens ($598): Another budget option for portrait photographers. The focal length is brilliant for situations where you don’t want to be too close to your subject. Sony FE 90mm f/2.8 Macro G OSS ($1,098): Optimized for macro and close-up portrait photography this lens provides excellent sharpness, depth of field, and color rendition. Its maximum aperture of f/2.8 is effective when shooting in low light and allows for shallow depth-of-field focus. Perfect macro lens for Sony A9 sports camera. Zeiss Batis 135mm f/2.8 ($1,999): This Zeiss Batis 135mm f/2.8 mid-length telephoto prime lens is ideal for portraiture, weddings and travel photography. Sony FE 50mm f/2.8 Macro ($498): The new FE 50mm F2.8 Macro lens features an ED (Extra-low Dispersion).The optical design also incorporates both an aspherical and an extra-low dispersion element, The lens is also dust and moisture resistant. Sony Zeiss FE 35mm f/1.4 Distagon T* ($1,598): Fast, sharp, and loaded with the latest technology, the FE 35mm f/1.4 ZA offers outstanding optical performance in a versatile 35mm focal length. The fast f/1.4 maximum aperture provides very effective low light capability and shallow depth of field control. Aperture ring designed for still or movie shooting, Corner to corner sharpness w/Advanced Spherical elements. Sony Zeiss FE 50mm f/1.4 Planar T* ($1,498): With its normal perspective, fast maximum aperture, and high-end design, the Planar T* FE 50mm f/1.4 ZA Lens from Sony is easy to see as a go-to standard optic for full-frame E-mount shooters. The bright F1.4 maximum aperture offers excellent low light performance and adds to the 11-blade aperture and aspheric elements for gorgeous bokeh. Compared to Sony Zeiss FE 55mm f/1.8, it has better low light performance and bokeh: excellent image quality, superb sharpness, smooth bokeh and well built. Sony FE 24-70mm f/2.8 GM ($2,198): This is the expensive and ultimate choice for mirrorless shooters. The lens is ideal for portrait, travel and event photography or even simple everyday shooting. Sony Zeiss Vario-Tessar T* FE 24-70mm f/4 ZA OSS ($1,198): The second one is the Zeiss brand version, if you can’t afford the GM model. Zeiss Batis 25mm f/2 ($1,299): As you know prime lenses almost always outperform zooms when improved sharpness and even better low light performance matters. This lens is ideal for architecture, landscape, and interior photography. There are many comparisons of Zeiss Batis 18mm f/2.8 vs Zeiss Loxia 21mm f/2.8. Zeiss Batis 18mm f/2.8 ($1,499): Well-suited to interior, architectural, and astrophotography applications, the Batis 18mm f/2.8 blends its extremely wide 99° angle of view with a high degree of functionality. It is extremely sharp all the way to the corners. Zeiss Loxia 21mm f/2.8 ($1,499): Excellent Manual Focus Wide Angle Prime Lens! Despite its compactness, the super wide-angle Zeiss Loxia 21mm f/2.8 Lens offers outstanding image performance. It is an absolute must for wide-angle fans who try manual focus often and want to capture even the tiniest details of a special moment in a photo or on film. Sony Zeiss Vario-Tessar T* FE 16-35mm f/4 ZA OSS ($1,348): An excellent lens if you’re looking for a wideangle zoom with Image Stabilization and high image quality. The focal length is perfect for landscape, group shots, weddings, architecture, indoor photography and more. Sony FE 90mm f/2.8 Macro G OSS ($1,098): Perfect macro lens for Sony a9! For those who frequently shoot macro photography and close-up portraits, the Sony 90mm f/2.8 is the very right lens: excellent sharpness, depth of field, and color rendition. Sony FE 100mm f/2.8 STF GM OSS ($1,498): A unique 100mm mid-telephoto lens featuring STF (Smooth Trans Focus) technology that can elevate portraits and subjects that benefit from smooth background bokeh to new artistic heights while boasting G Master resolution. Sony FE 70-200mm f/2.8 GM OSS ($2,598): This is a high quality glass with pro-grade image quality and build. Ideal for Photojournalists, sports and wedding photographers, it covers portrait-length to telephoto perspectives and it is sharp, focuses quickly, has minimal distortion. Sony FE 70-200mm f/4 G OSS ($1,498): If you don’t need f/2.8 with IS as well, then this is the best you can get. It is as sharp as the f/2.8 version for less than half the cost. Sony FE 70-300mm f/4.5-5.6 G OSS ($1,198): Ideal for travel, landscape and wildlife photography, the Sony FE 70-300mm f/4.5-5.6 G OSS lens it has the longest reach of any FE lens to date. Sony FE 100-400mm f/4.5-5.6 GM OSS ($2,498): The lens you must have for sony a9! The first super-telephoto zoom in Sony’s flagship G Master series covers a versatile 100mm to 400mm range with outstanding sharpness, fast AF and compact design. It’s an exceptionally powerful photographic tool for a variety of enthusiast and professional shooters, in particular those that are commonly shooting sports or wildlife. Highly recommended! 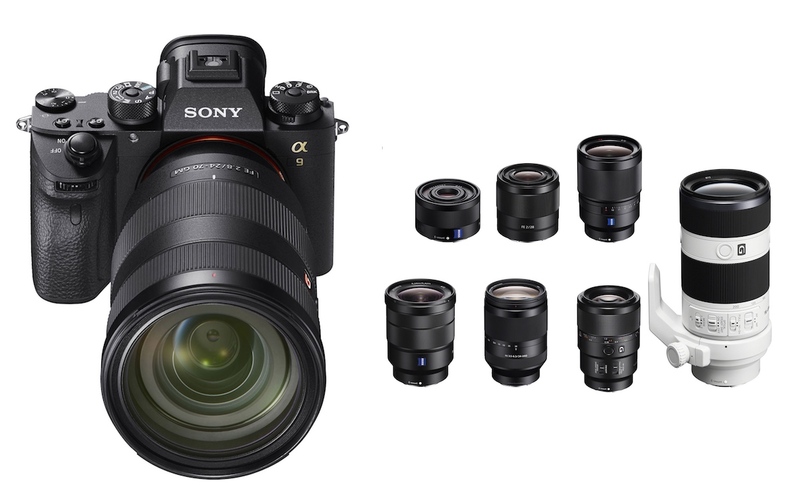 In addition, the Sony FE 1.4x & FE 2.0x Teleconverters ($548) are specially designed for the Sony FE 70-200mm F2.8 GM & Sony FE 100-400mm f/4.5-5.6 GM OSS Lenses. Sony FE PZ 28-135mm f/4 G OSS ($2,498): Designed to satisfy 4K production requirements, the Sony FE PZ 28-135mm f/4 G OSS Lens is a wide-ranging zoom lens that covers wide-angle to telephoto perspectives while adding many features for your full-frame Alphas A9 camera. G-series optical design ideal for HD and 4K moviemaking. Rokinon AF 14mm f/2.8 FE Lens ($849): The Rokinon 14mm F2.8 AF achieves optimal performance with reduced size and weight. It’s IF (Internal Focusing) auto focus system is compatible with both phase detect and contrast detect sensors for fast, quiet and accurate focus detection. Rokinon AF 50mm f/1.4 FE Lens ($699): Designed specifically for Sony full frame E-mount cameras, this new high speed prime combines advanced optical technology with a fast, quiet and precise auto focus system. Along with the Xeen Cine Prime lenses listed below, Rokinon also offers a wide range of cinema versions of their manual focus E-mount lenses adapted to include T-stops, clickless aperture and focus gearing. The lens comes in Sony E-Mount and features industry standard geared focus and iris rings that share common position with other Rokinon Cine DS lenses. To aid focus pullers who have to work both sides of the lens, the aperture and focus scales are marked on both sides of the lens. Rokinon Xeen Cine lenses are built specifically for using as cinema lenses for Sony E-mount. They feature an internal focus design so that the lens does not change size while focusing to minimize the appearance of breathing when changing focus. Each lens in the set is multi-coated for good contrast, glare prevention, and are color matched to a factory standard, allowing you to assemble a set over time with minimal color shift. The 11-bladed iris provides a rounded aperture for a natural looking highlights and Bokeh.